By GreenEyedLillies on January 16th, 2009 . Filed under: Bakeries . i was just reading your cupcake blog and you have a little story on the petite cafe. yes their cupcakes are good, and i frequent there up until about a year ago i stumbled upon a real cupcake gem, just 5 minutes away from them. it’s called joe’s java, and they have some of the best cupcakes i’ve ever had. the owner really takes her time when it comes to cupcakes. not only to they have cupcakes they have a coffee called cupcake and a hot drink called “the nikki cupcake”. they donate cupcakes to a lot of local events too. to top it off their cupcakes are $2 each! 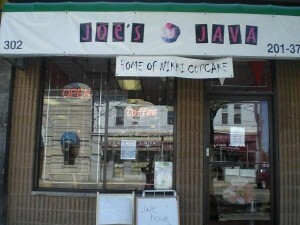 Joe’s Java is located in Lyndhurst, NJ. Please visit Joe’s Java for more information. « Magpies Presidental Cupcakes January 19th and 20th only! What a joke, the icing on these cupcakes is from a box, Petite rules! In addition, the place is filthy and so is Nikki. The girl doesn’t own a bar of soap……very sad.